Eye Photo is a non-profit retinal photography service operated by the MSO to help primary physicians screen their patients for diabetic retinopathy. An annual retinal examination to screen for diabetic retinopathy is a standard of care in diabetes mellitus. See "Why Screen for Diabetic Retinopathy?" [Watch video: Screening for diabetic retinopathy]. This examination may be carried out by the primary physician using direct ophthalmoscopy or by referral to a specialist eye clinic. 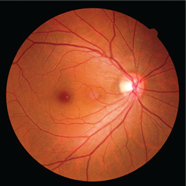 If the primary physician is unable to do the screening, or if the patient does not wish to be referred to an ophthalmologist, community-based retinal photography is an option that is effective and efficient. See Retinal Photography for Diabetic Retinopathy Screening. Eye Photo is a photography service that is operated by non-medical staff. We take high-resolution retinal photographs for patients that primary physicians may use to look for signs of sight-threatening diabetic retinopathy. We do not give reports, provide medical advice, comment on patient care, endorse or sell any products, give recommendations for eye specialist referrals or retain patient data/records. Our target population is the diabetic community that is currently under-screened owing to lack of awareness, lack of access to other means of screening, or both. It is not our aim to replace any existing medical eye care that patients may already be receiving. Retinal photography for diabetic retinopathy screening is purpose-specific, and cannot be relied on to exclude the presence of coexisting eye conditions, such as glaucoma or macular disorders. Hence, patients who desire a comprehensive eye evaluation should be advised to see an ophthalmologist, instead of undergoing retinal photography alone. Please note also that some patients may not be suitable for retinal photography if they have small pupils or significant opacities in their ocular media. See Before Sending a Patient. Interpretation of the retinal photographs is done by the referring physician. See How to grade diabetic retinopathy. The MSO also conducts Diabetic Retinopathy Grading Workshops to help primary physicians to do this more confidently. See More resources – workshops and reference materials. The physician then decides on the appropriate next course of action based on the findings. See Screening schedule and flow chart. Mondays to Fridays: 8am-5pm Sat, Sun and public holidays CLOSED.